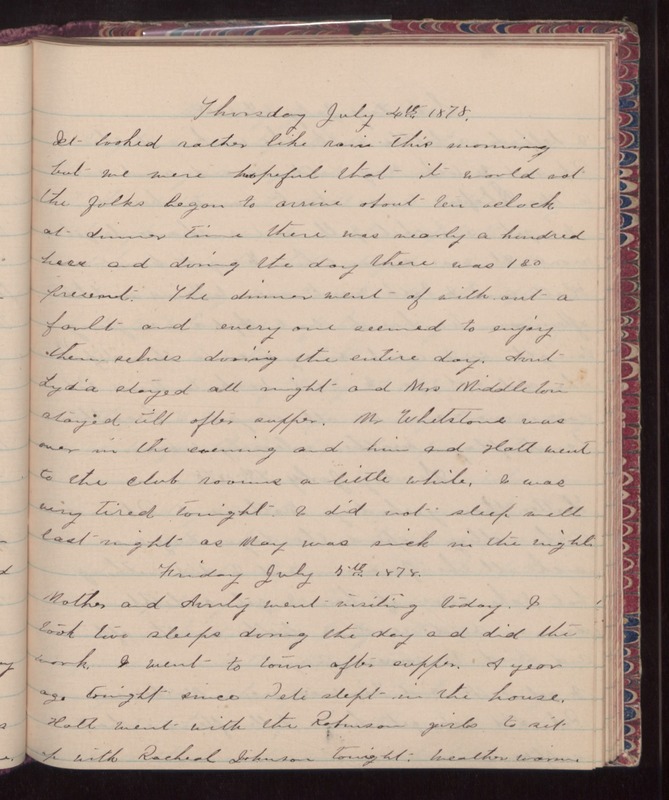 Thursday July 4th 1878 It looked rather like rain this morning but we were hopeful that it would not. The folks began to arrive about ten oclock at dinner time there was nearly a hundred here and during the day there was 130 present. The dinner went of without a fault and everyone seemed to enjoy themselves during the entire day. Aunt Lydia stayed all night and Mrs Middleton stayed till after supper. Mr Whetstone was over in the evening and him and Hatt went to the club rooms a little while. I was very tired tonight. I did not sleep well last night as May was sick in the night. Friday July 5th 1878 Mother and Aunty went visiting today. I took tow sleeps during the day and did the work. I went to town after supper. A year ago tonight since Pete slept in the house. Hatt went with the Robinson girls to sit up with Rachel Johnson tonight. Weather warm.